Although the citizens of Edinburgh traditionally celebrated Hogmanay at the Tron Kirk, the arrival of the New Year is now celebrated in Princes Street against the background of Edinburgh Castle. After midnight a street musician known as the One Man Band playing a bass drum, cymbals and a mouth organ would lead the revellers from the Tron, back along the South Bridge and Nicolson Street. The Tron Kirk clock is still maintained by James Ritchie & Son the firm which designed the clock set up on the Half Moon Battery to fire the One o’ Clock Gun in 1861. This week’s photograph shows Rock House which stands to the left of the steps leading from Regent Road to the Nelson Monument on the Calton Hill. In the 1840s, the house was the home of the scientist Robert Adamson, who teamed up with the artist David Octavius Hill to exploit the new calotype process of photography. Starting off by producing portraits of ministers of the newly established Free Church of Scotland, by combining their knowledge of chemistry and art, the two men produced thousands of calotypes during their successful partnership. In addition to photographing the city’s prominent landmarks and citizens, Hill and Adamson produced historic calotypes of soldiers stationed at Edinburgh Castle and Leith Fort. Many of the photographs the partners produced including family members and friends were taken and developed in the studio standing in the garden of Rock House. 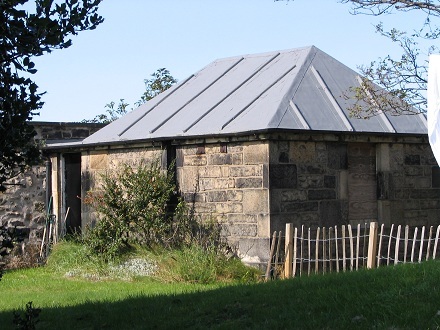 Wednesday 14th December marks the 200th anniversary of the founding of the Astronomical Institution of Edinburgh. In addition to Robert Stevenson the lighthouse engineer, the membership consisted mainly of land owners, advocates, bankers, academics and clergymen. Chairing the meeting, the Lord Provost pointed out the need for observatories to be set up in Britain. Nautical astronomy was vital, not only for the safety of the ships arriving and departing from the Port Leith, but for the defence and prosperity of the country as Britain was at war. This week's photograph shows the Gothic observatory on the Calton Hill where the members of the institution gathered for meetings. This week’s photograph shows the Dugald Stewart Monument which stands on the Calton Hill not far from the Playfair observatory. Commissioned by the Royal Society of Edinburgh and built in 1831 to the design of architect William Henry Playfair, the monument was inspired by the Choragic Monument of Lysicrates in Athens, Greece. When the Scottish philosopher and mathematician who was a professor at the University of Edinburgh died in 1828, he was buried in the Canongate Church's burial ground. This week’s photograph shows Mr David Watt Ritchie taken during the unveiling of the plaque outside Frederick James Ritchie’s house at 6 Brunton Place (London Road), Edinburgh in June 2010. David Watt Ritchie is a direct descendant of Frederick James Ritchie the horologist and proprietor of James Ritchie & Son, 25 Leith Street, Edinburgh who adapted the observatory’s master clock to send the time to the Nelson Monument time ball and the clock which stood beside the One o’ Clock Gun on the Half Moon Battery, Edinburgh Castle. Frederick James Ritchie was a close friend of Alexander Graham Bell the inventor of the telephone and Alexander Bain the inventor of the electric clock. Wednesday 23rd November marks the anniversary of the death of Thomas Henderson, Scotland’s first Astronomer Royal. Diligent, practical and a first class mathematician, he was appointed to the post in 1834 due to the high standard of work he produced while employed at the Cape of Good Hope's Royal Observatory. 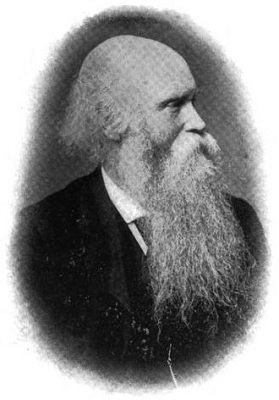 Professor Charles Piazzi Smyth also learned his trade at the Cape which must have been an asset when he was appointed Astronomer Royal for Scotland in 1846. The Scots born astronomer who was made a Fellow of the Royal Society in 1840 is buried in Greyfriars Kirkyard. Although he does not have a headstone, his memorial stone can be seen at the west corner of the Calton Hill observatory. Saturday 19th November marks the anniversary of the death of the landscape artist Sam Bough. Sam loved to paint the Bass Rock in East Lothian which can be seen from the top of the Nelson Monument. Sam also painted the original hanging sign for his local pub the‘Volunteer Arms’ which stands at the corner of Jordan Lane and Morningside Road. When Sam Bough died in 1878, he was buried in the Dean Cemetery, Edinburgh. 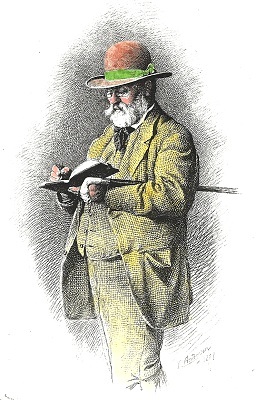 The etching by Robert Anderson R.S.A was taken from a photograph. This week’s photograph shows the Portuguese cannon which stands in front of the City Observatory on the Calton Hill. Acquired during the third Burmese War of 1886 when a British expeditionary force captured Mandalay and added Burma to the British Empire, the cannon was donated to the City of Edinburgh. The 17th century fieldpiece was displayed at the 1886 International Exhibition which was held in the Meadows, before being placed on the Calton Hill not long after the exhibition closed. Reproduced by permission of the Royal Society of Edinburgh, from the RSE’s Piazzi Smyth Bequest, held on deposit at the Royal Observatory Edinburgh. 2011 marks the 150th anniversary of the setting up of the One o’ Clock Gun. 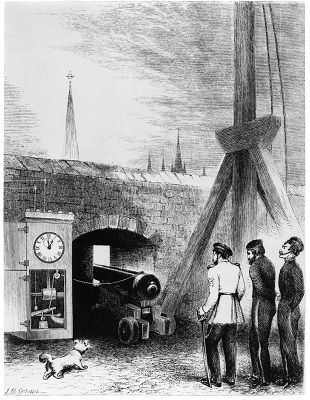 The engraving based on a drawing by Professor Charles Piazzi Smyth shows the time-gun standing next to the flag pole on the Half Moon Battery at Edinburgh Castle. The astronomer worked with Chief Master Gunner Findlay and horologist Frederick James Ritchie to set up the city’s audible time service. The Royal Artillery donated the time-gun to the City of Edinburgh plus two gunners to load and maintain it. The One o' Clock Gun which now stands on the Mills Mount Battery is maintained by 105th Regt RA (V). The Regiment celebrates its 25th anniversary at Artillery House, Colinton, Edinburgh on Saturday. Friday 27th October marks the death of Ralph Copeland the third Astronomer Royal for Scotland. Born at Moorside Farm, near Woodplumpton, Lancashire, England, he was educated at Kirkham Grammar School. Appointed Astronomer Royal for Scotland he was given the job of selecting a site for a new observatory. 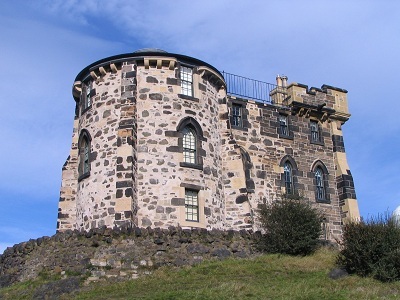 In addition to donating scientific instruments, Lord Crawford gifted his library to the new Royal Observatory on the Blackford Hill which opened in 1896. Ralph Copeland is buried in Morningside Cemetery. Admiral Lord Nelson’s signal was flown from the Nelson Monument to mark the anniversary of the Battle of Trafalgar. Following a long established tradition, a wreath in the form of an anchor was set up on the right hand side of the front entrance at 11.00 am. 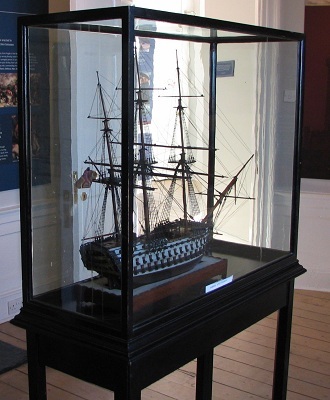 Friday 21st October marks the anniversary of the Battle of Trafalgar. A wreath laying ceremony is held at the Nelson Monument in the morning and the admiral’s signal ‘England expects that every man will do his duty’ is flown from the tower. The sea battle gave the United Kingdom of Great Britain and Ireland control of the seas, removing the possibility of French invasion. Five of the ships which took part in the battle were commanded by Scots captains. Presented to the City Museum, in 1916, the model of H.M.S. Victory was transferred to the Nelson Monument seven years later. Edinburgh City Council plan to illuminate the capital’s skyline. Professor John Brown, Astronomer Royal for Scotland reckons that illuminating buildings such as Fettes College and the three spires of St Mary’s Cathedral at the West End would be an expensive mistake. Senior councillors including Councillor Stuart Roy McIvor, who chaired the planning committee meeting defended the scheme, stating that city lighting has advanced tremendously and no longer results in creating upward pollution. He added that although satellite maps show an increase in clusters of light over the years, he was convinced that the new proposal will not add to the problem. 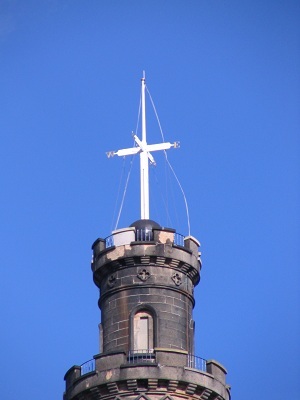 Professor Piazzi Smyth had to cope with the same problem when he was based at the City Observatory on the Calton Hill. Scotland's second Astronomer Royal overcame the problem by transporting his scientific instruments by mule train to the top of a mountain in Tenerife. This week’s photograph shows the Transit House which stands close to the City Observatory. In 1812 a transit telescope and a clock with two dials were installed inside the small building. The clock was positioned at the window so that the townspeople and mariners from the Port of Leith could set their watches and chronometers to the correct time. Fitted with a dial at the rear so that it could be checked by the astronomer it was known a the ‘Politician’s Clock’ as it had two faces. The timepiece which was later converted to an electric clock by James Ritchie & Son can still be seen in the observatory. Doors Open Day at the City Observatory was a great success. Colonel Huthwaite the commanding officer of 105th Regt RA (V) and RSM Roxby were welcomed by David Small, President of the Astronomical Society of Edinburgh. Starting at 11.00 am Bruce Vickery and Lucas Marijnissen gave the visitors a entertaining run down on the history of the building and the clocks connected to the time system until the observatory gate finally closed at 4.00 pm. Thanks are due to the Astronomical Society of Edinburgh volunteers especially Jack Richardson for the efficient way he organised the enthusiastic groups visiting the observatory.